GamerDad: Gaming with Children » Ozobot Evo and the Avengers! 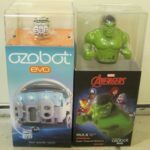 Ozobot Evo and the Avengers! Anyone remember those car toys where you could draw a black line on paper and the car would follow it? I think they first came out in the 70’s but I’m not sure. Well now those kinds of toys have reached the 21st century with Ozobot Evo. Not only does this robot follow black lines on paper, but it can also detect other colors as well. And when those colors are in certain patterns, they act as a code to tell Ozobot what do to, like turn directions, go backward, and much more! But that’s not all. Now you can get limited edition skins for Ozobot based on Marvel’s The Avengers characters, which give the little robot even more personality. Click here to read more! Here is a bigger shot of both the toys in their boxes. Really the most complicated thing about these toys is figuring out how to open the boxes to get to them! Seriously, you need a college degree to open them! But that’s the hardest part of the setup. Everything else is easy. Here a shot of the Ozobot Evo out of the box. I put a dime next to the box so you can see how small it is. One of the coolest things about the Ozobot Evo is the packaging. On the left side you have little boxes with tabs you can pull out like drawers. These hold some of the accessories like the markers you use to draw the lines, a protector skin and bag, and the USB charger. The other side holds cards with various activities and things we’ll get to later. This is great because it encourages kids to put away their toys so they don’t lose anything. One of the first things you’ll want to do with Ozobot Evo is charge it up after you get it out of the box, as most electronics don’t have a full charge when you first get them anyway. Another neat thing about Ozobot is all the lights it has. Even when charging, it’ll light up five lights from red to green, letting you know how much time it has left to charge. But one disadvantage is the USB charger cord is so short it’s almost a joke. Seriously, it’s like 3 inches long! You can download an app on iOS and Google Play that lets you do things with Ozobot Evo. But even without the app, you can still play with it. Cover its sensors to play games like making music or running away from your hand. One warning: cats love to play with Ozobot, too. I can say that with personal experience. And the Ozobot will still follow lines you draw with or without the app. Connecting the Ozobot with the app is easy to figure out and do. You first register your Ozobot and give it a name (I named mine Mega Man because of course I would). Then you can earn stars to learn the basics of using your Ozobot using play cards included in the box. After that you can use the app to watch YouTube videos giving you ideas on how to play with Ozobot, as well as games and codes to try. The play cards are on the other side of the box, and also include stickers you can use to decorate and customize your Ozobot. And if you mess up when coloring one of the special codes, you can use other stickers to place over the messed up codes to try again. 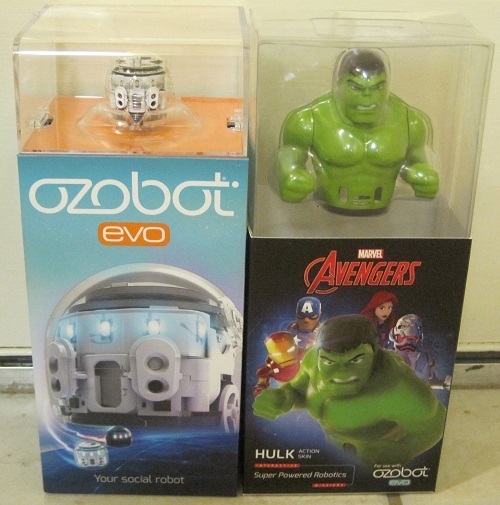 You can also buy special skins based on Marvel’s The Avengers that let you do even more things with Ozobot Evo. The characters you can get are Iron Man, Captain America, Hulk, Black Widow, and Ultron. 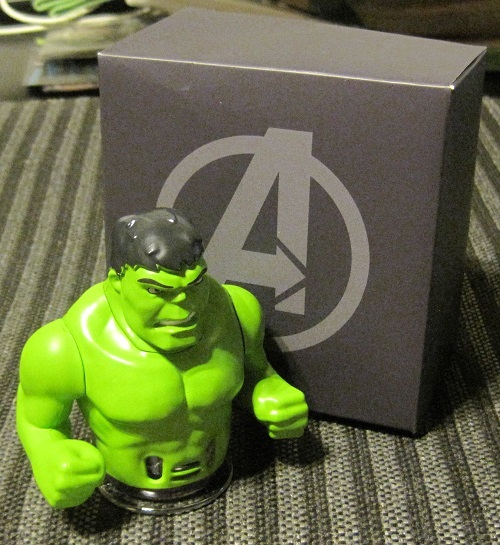 I got the Hulk to review, here’s a picture of it out of the box. All you do it stick the Hulk skin on top of Ozobot and plug the attached USB cord connecting the Hulk to Ozobot. One thing is that it’s pretty hard to take off. But the Hulk skin adds new sounds, lights, and movements for Ozobot, as well as a new interface for the app, and that’s pretty much it. So it doesn’t do as much as regular Ozobot does, but the price is right. I found that it disconnected from the app a couple of times with the skin on, though, for some reason. I’d say if your kid can read and has an interest in robots, they’ll be fine with Ozobot Evo. Although since you do have to use an app and it can connect to YouTube, parental supervision is recommended and you should be comfortable with your kids using a cell phone or tablet. The big downside with Ozobot Evo is the price. The thing costs 100 bucks, which is a bit steep. In its defense, it does have a LOT of lights and sounds, and it’s definitely educational. In fact, if you’re a teacher, you can check out the Ozobot Web site for STEM lessons involving it. They do make a version of Ozobot for younger kids called Ozobot Bit that’s a little over half the price, so that may be a good alternative. The Avengers skins are pretty reasonably priced at 15 bucks each. But if you’re kids love robots and have in interest in coding and programming them, this may still be a good investment anyway. After getting really into Disney Infinity and Skylanders, this is the next thing I should do. It just needs to interact with a video game and it’d be perfect.